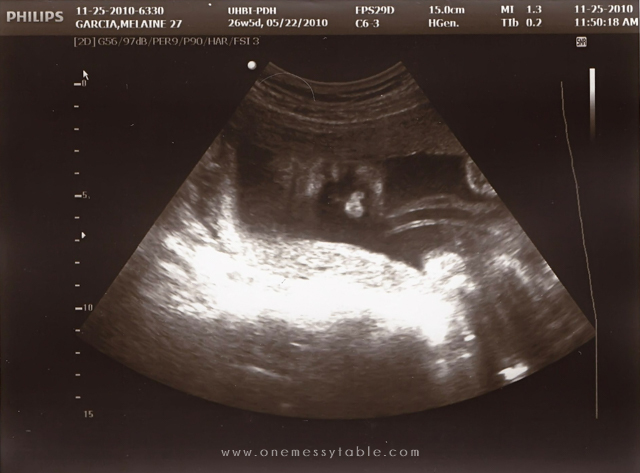 26 Weeks: It's a GIRL! I knew it! I just knew it's going to be a girl! It's the best day ever and it's funny how the ultrasound went through. I was lying and relaxing on the bed while the doctor was gliding the transducer on my belly and tinkering on the machine at the same time. I was still talking and laughing with the hubby while we're looking at the monitor when the doctor suddenly blurted out "It's a girl!". LOL! We were surprised not only because we finally knew our baby's gender but we were also caught off guard! Lol! Doc, you should've told us that we're on! No words could ever explain the joy we have now. I saw my husband teary-eyed while watching the baby moved in the monitor. I will always adore that moment... the soft look in his eyes knowing he's going to have two lovely ladies in his life now. Priceless! Okay, off to plan the baby shower now!!! But wait, we have to think of a name first. LOL! Thank you, Lord, for the wonderful gift!